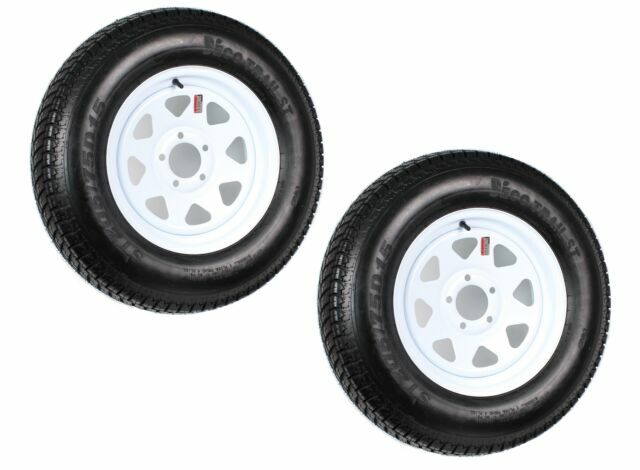 Pre-Mounted Trailer Tires & Wheels; 2-Pack Trailer Tires & Rims Bias Ply 205/75D15 Load C 5-4.5" White Spoke 15"; Tire Size: 205/75D15; Aspect Ratio: 75; Section Width: 205; Load Range: C; Tire Weight Rating: 1820 Lbs. ; Maximum Pressure: 50 PSI; Tire Composition: 6 Ply; Tread Depth: 7.8/32"; Sidewall Description: BSW; Speed Index: M; Load Index: 101/97; Internal Tire Type: Tubeless; Rim Size: 15" X 5"; Bolt Configuration: 5 Lug 4.5" Center; Offset: 0"; Center Bore: 3.19"; Rim Construction: Steel; Rim Style: Spoke; Rim Color: White; Wheel Hub Diameter: 6.50"; Lug Value Hole: 0.45"; Hub Stud Size/Nut Requirement: 1/2"-20 60 Degree Cone Nut; Torque Specifications: 90-120 Ft/Lbs. ; Warranty: Two Years; Pack Quantity - 2-Pack. Bought these tires for a lot less than having my existing 8 yr old tires only replaced... My rims on my Mature RV showed signs of wear as well... Buying 4 of these tire and rims really spruced up my RV and for a lot cheaper than buying replacement tires alone.. I was able to check the brakes and re-grease by bearings at the same time.. And they ride great! Would recommend! Ordered because I needed spare tire for utility trailer. After researching I bought this product because of warranty and brand listed, Dexter sells many trailer parts. Product size was correct and fit perfectly, no blemishes. Tires look good, the were described properly. I replaced both original ties and wheels on my trailer and am using them as spares. This is initial comment. The 2 tire wheel package was shipped promptly and arrived early. As of this point in time I am very satisfied. These tires came quickly and ride wonderfully on my trailer! Highly Recommended!! Great tires, trailer ride so good! !